Mother’s Day comes each year in May and with it comes a choice—what to do for Mom to make sure she feels special and appreciated? While flowers and a card might be standard, Seattle has so much more to offer! Take your mom (or the whole family) out on the town, head to one of the area’s best restaurants for an amazing brunch, set sail to Blake Island, or shop locally for unique gift ideas. In 2019, Mother's Day falls on May 12. Breakfast and brunch are the quintessential ways to celebrate Mother’s Day, and there is no shortage of options in Seattle. Whether you want something downhome and cheap, or the brunch of a lifetime, Seattle’s many restaurants are here to help you dazzle your mom. For down home, look to Portland-based chain The Original Pancake House. Or check out the Macrina Bakery, which serves brunch every weekend. With a constantly changing menu at Macrina, you’ll never have the same experience twice. If you enjoy a more upscale experience, Seattle has several options that serve brunch every weekend. Star chef Maria Hines’ restaurant Tilth is a perfect example of an establishment with amazing, organic cuisine, and yet a warm and cozy atmosphere set in a house. Or try out Lola, a restaurant by popular Seattle chef Tom Douglas. Serving up Greek dishes alongside traditional breakfast favorites, Lola offers a uniquely delicious twist on Mother’s Day brunch. Seattle cruise companies come out in force for Mother's Day, most offering special Mother's Day cruises with a brunch or lunch buffet, live music and other happenings on board. Argosy's signature Blake Island cruise is all about mom on May 12 at 10 a.m. Blake Island cruises do not have a buffet on the ship, but instead cruisers are treated to a baked salmon buffet and gifts for all mothers once they reach the island. After the meal, visitors watch the regular Tillicum Village show about native cultures. 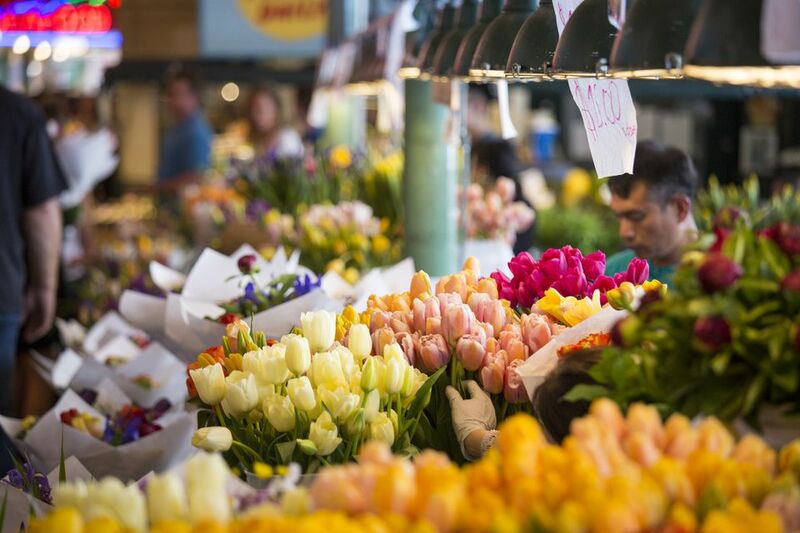 Of course, there is always Hallmark or the grocery store florist, but Seattle has so many boutique gift and flower shops — why not go local? Going local means more unique and not necessarily more expensive. There are literally hundreds of small gift and/or flower shops in the Puget Sound area, but below are a few suggestions. Seattle floral shops include Willow and Bloom, Pike Place Market and Maxine’s Floral and Gift. Seattle certainly has no shortage of local gift shops to choose from, serving a wide variety of tastes and interests. Shop for artistically inclined gifts at the Fireworks Gallery; get a little quirky and kitschy at Archie McPhee; shop for books, books and more books at Elliott Bay Book Company, or search for something a little different at Stuhlberg’s, Clover House, and Laura Bee Designs. Seattle is also home to plenty of food and drink producers. You can't go wrong with some salted caramels from Fran's, a growler of local brew or cider, or a bottle of wine from one of the wineries in Woodinville. One of the best free things to do in Seattle is simply to get outside — and doing just that is a great way to celebrate mom if said mom enjoys the outdoors. Stroll the Volunteer Park Conservatory or sign up for a free sail at the Center for Wooden Boats. Go on a hike through Discovery Park with the family and enjoy some time on the beach. Or just head to a nearby park with a picnic. For families with younger children, brunch may or may not be an especially relaxing way to celebrate the mom in your life. If you don't anticipate your little ones sitting still during the most likely longer than average wait times for food (because, unfortunately, all the other moms want waffles too), never fear! Seattle is also home to the Woodland Park Zoo and the Seattle Aquarium, and both are fabulous family outings that involve animals, getting outside and fun. Nearby Woodinville is lovely in May, with rolling green hills dotted by what feels like endless wineries and tasting rooms. Go with a larger winery like Chateau Ste. Michelle and add in a tour and lunch, or find a cozy smaller tasting room and chat with the staff or owner while you learn all about the wine you're tasting. Either way, wine tasting is perfect for taking mom out on a date, or outings with kids who have topped 21. Moms get a free train ride with any paying child on May 11 or 12 on the Snoqualmie Valley Railroad, which travels along 5.5 miles of original railroad from the 1880s (read: the ride might be a little bumpy here and there). Trains leave from both the Snoqualmie Depot (great to pair with a stop by Snoqualmie Falls) or the North Bend Depot, and the ride lasts for about two hour round trip, including a stop at the Railway History Center. Does mom love to laugh? Then treat her to a comedy night out! This special comedy show is all about the trials and tribulations of parenthood, so there's plenty of natural material to be had. Tickets are just $5 with the discount code IMAMOM and the show takes place at Unexpected Productions in Pike Place Market. May 12 brings with it a few opportunities for moms everywhere to pound the pavement and maybe get rid of a bit of stress with a healthy dose of runner's high. Running makes a great solo mom event, or bring the family along too. The Color Run kicks off at Seattle Center, while the Mother's Day Half Marathon and 5K starts at Northwest University in Kirkland (half marathon) and Juanita Beach Park also in Kirkland (5K).